According to The Guardian, Spanish artist Carlos Ezquerra—the designer and co-creator of iconic British comic book character Judge Dredd—has died. The Guardian doesn’t list an official cause of death, but it does note that he revealed in 2010 that he had been diagnosed with lung cancer that one of his lungs had been removed (writing on a message board, “who the hell needs two for drawing?”). Ezquerra was 70. Born in Spain in 1947, Ezquerra got his start doing art for war stories published by Spanish companies. In the ‘70s, he started doing uncredited art for British pulp magazine The Wizard and caught the attention of Pat Mills and John Wagner, an editor and writer for British war comic Battle Picture Weekly. Over the next two years, Ezquerra illustrated almost 100 stories for the “Major Eazy” strip, and he eventually got the call from Mills and Wagner to help develop a new character for the then-upcoming sci-fi comic magazine 2000 AD. Dredd was envisioned as a Dirty Harry-style super-cop, and Wagner suggested Ezquerra draw him like David Carradine’s leather-clad biker character from Death Race 2000. From that basic pitch, Ezquerra added heavy body armor, various chains and zippers, huge shoulder pads, and a futuristic cityscape in the background that convinced the editor to change the planned setting from the near-future to the far-future. 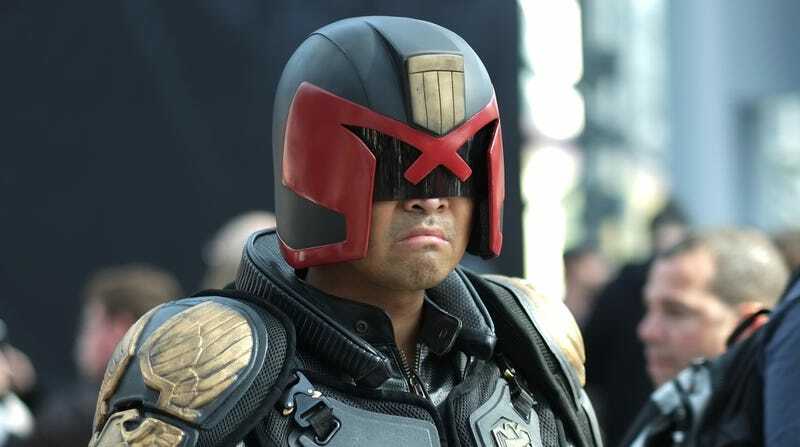 Before the first Judge Dredd story could be published in 2000 AD, though, the publishers’ board of directors decided Wagner and Ezquerra’s work was too violent and brought in a different writer and artist. Ezquerra soon quit the project altogether, either because he was frustrated that another artist was working on the Judge Dredd stuff or because he had been offered a deal to go back to Battle Picture Weekly, but he and Wager did eventually come back to 2000 AD to work on the Judge Dredd stories and to create the “Strontium Dog” strip for the short-lived Starlord sci-fi comic series. In 1988, “Strontium Dog” protagonist Johnny Alpha was killed off, but Ezquerra reportedly refused to draw the strip because he was so attached to the character. It is difficult to put this into words, but we have lost someone who was the heart and soul of 2000 AD. It is no exaggeration to call Carlos Ezquerra one of the greatest comic book artists of all time, and his name deserves to be uttered alongside Kirby, Ditko, Miller, Moebius, and Eisner. Yet this doesn’t really do justice to someone whose work was loved by millions and has had an influence far beyond the comic book page. From “Judge Dredd” to “Strontium Dog,” from “Rat Pack” to “Major Eazy,” Carlos has left us with a legacy of stunning and distinctive work that was and always will be 2000 AD. He has been one of the pillars, producing the same dynamic, enthralling, and arresting art we always loved him for. We thought we had many more adventures to come from the master, so we are devastated to discover we were wrong.